There are 2 reviews for 'Justice Chronicles'. Gameplay: no quirks or bugs noticed. You don’t get to traverse the World Map slaying random encounters since you can just enter any unlocked area you desire by clicking on it. You do get plenty of random encounters in the massive, twisting, confusing, and seemingly endless dungeons. But our webmaster fixed that prob by creating maps for every dungeon in the game. (The joy of having friends in high places.) I cannot, and will not, encourage anyone to attempt playing this game without dungeon maps. The dungeons get increasingly intricate and confusing very early on in the game. The good things about the long dungeons are that you desperately need the drops, steals, and gold coins for equipment crafting- which is necessary. Plus, the XP you rack up quickly leaves you with no regrets about it when you’re in the next dungeon 😉. So, you need to spend a lot of time in dungeons, or the baddies are just gonna keep tossing you around like a ragdoll. You do not buy new equipment in every new town you visit. In fact, you buy only a few pieces of the same weps and armor for each of your MCs throughout most of the game. Later on, a few more pieces are added. Gear is frequently upgraded through crafting. It’s ALL about the crafting in this game. It’s fun and perfectly challenging to do. There aren’t subquests in this game, but there are a plentiful amount of cool Requests, “my pretty.” (That inside joke won’t make sense to you until you play the game.) The Requests shouldn’t be optional, unlike SQs typically can be. The completion of each Request is an absolute help for game progression. You gain necessary things and you end up becoming much stronger & more familiar with the landscape. Word on the street is that game play is about 40 hours long. You could probably +/- about 10 hours depending if you’re a die-hard grinder or an “Indiana Jones” type of player. You definitely get your money’s worth with this game. There are low-cost in-app purchases bought with in-app currency, but purchases are not necessary to complete the game or to enjoy it. The in-app currency used in the store is earned in the game. The mechanics of the game do require a small amount of patience to learn. The game’s design is quite unique – in many ways. Once you nail down the whole premise of the “camp” menu and the Guardian Beasts, you’re gonna be owned, because you WON’T wanna put down this game. Life is just going to be an interference for you while you play Justice Chronicles. Controls: no major issues, and definitely not any that impair or hinder the game. While walking near corners of walls or ledges, your party may look like they’re playing “Sit and Spin.” It’s not a bug issue. It’s just a bizarre hiccup. Don’t be alarmed by it. It’s harmless. Battle System: I gave a mid-way mark not because I’m unsure of how to rank the category. It’s because the Battle System is unlike anything I’ve ever seen. Since you start off all confused but graduate to addicted, it seems appropriate to adjust the star rating for the game. It’s something you’re not gonna love- at first. But once you (rather quickly) get accustomed to how the Battle System works, you won’t dislike it, either. MCs get a Guardian Beast – kinda like a battle “buddy.” The role of the Guardian Beasts is an unfamiliar strategy in RPGs, but it’s not a bad one. If you want, you can switch Guardian Beasts between MCs to see if you like a particular pairing of MC and Guardian Beast more than another pairing. It’s an interesting concept, and it’s fun. We have no control over the Guardians Beasts’ innate abilities. However, we must be skillful in how, and even when, we equip them with items, and get them to contribute in battle. There’s an element of surprise with each and every Guardian Beast in AND out of battle mode. Because of that originality, the Guardian Beasts can, and will, leave you talking to yourself: Oh! Where were YOU just then when I wanted a massive party heal (or) a cataclysmic enemy anhilation?? Or, OMG! What kind of insane attack was THAT!?! It can take a little bit of time to figure out the Guardian Beast premise and to accept that WE will not have complete control over what we think belongs to us. Not having control over a few abilities doesn’t make the Battle System a deal-breaker for the game. It turns out to be something you just don’t have concern for in the game. And, oh, battles are turn-based. Skill System: complex, but simple. There are skill trees for weps and armor. The skill trees branch out to similar, but slightly different gear. There are also Meteorites that give our chars their skills/abilities/spells. The skills also develop (here it is again) into “similar, but slightly different” skills and spells. The skill trees for weps & armor aren’t difficult at all to understand, since they are not real elaborate. But the skill trees do give us the option to diversify our weapons. There is only one wep per MC offered in the game, but later on, more get added for the chars. That’s it. What you DO with that only wep will be determined by your elemental needs, physical vs magical attack, the amount of loot you have to upgrade the gear according to the skill tree, the amount of necessary items you have to do the upgrades, and your willingness to grind for gold and mats to do the ever-increasing expensive upgrades. There is a somewhat critical-thinking process to it all. Don’t be deceived by the one-weapon idea. Trust me. Meteorites give us our skills, and through battles, we can exponentially increase their capabilities. For example, a Meteorite that has a heal ability for one player, will also gain a party-heal ability once the Meteorite “CP” reaches the “Mastered” level. Likewise, a Meteorite with a single-target attack, can become Mastered to an all-enemy attack. If a Meteorite can become Mastered, then it will gain (up to eight) stars from there- which increases the power of the Meteorite’s effect. Like the Guardian Beasts, the Meteorites can be alternated between MCs if you want to try different battle tactics or if you find a skill more appropriate for another char based on their stats. So many options, but so little space to put them all. So many hours in our lifetime, but so few hours in a day to play this incredible game. Many games can be similar and we will still play them without even having the idea of “been there, done that” pop into mind. Because we just love RPGs. I’ve been playing RPGs for 35 years, and numerous times I’ve been blown away by originality, cleverness, challenges, and nuances. 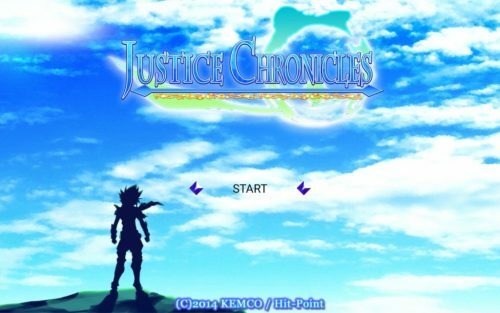 Yet, of all the games I’ve played with those qualities, in all the decades I’ve played, I have NEVER seen an RPG created so bravely, uniquely, and as nearly flawless as Justice Chronicles. As a matter-of-fact, I never even wrote a review for a game. I think enough of this game to urge anyone and everyone to play it. Hit Point has a lot of games that rely on weapon crafting: Machine Knight, Cross Hearts Arcadia, Chronus Arc, Fantasy Chronicle, Bonds of the Skies, and to some extent, even Crystareino (although in that game, synthesizing is purely optional.) Justice Chronicles combines weapon-crafting with a truly awesome story, a great battle system, and a one-of-a-kind menu system that makes it easier to find what you’re looking for. It also features side quests that reward you for farming resources, and some really cool bonus material.